This was my second time doing the red carpet event on opening night of the TCM Classic Film Festival. Why was a silent film accompanist invited to walk down the red carpet? Who knows? It was part of the invite for the opening night, and — once again, like last year — I figured…”what the heck?” I’m interesting in what showbiz things look like from behind-the-scenes, but mainly I figured people I know or who are fans might be interested in hearing about it. I took a trip down the carpet at last year’s festival and posted about it here, and so I kind of knew what the drill might be this time. Step one was being driven in an Escalade from my hotel to the start of where the carpet procession began, a three-block journey I shared with Sarah Karloff (Boris’s daughter). We chatted about the one thing we had in common: we both know film restorationist and historian Eric Grayson. “He’s preserving some of my father’s films!” I mentioned that I knew about Eric’s work on King of the Kongo, the first sound (part-talkie) serial, which Boris has a role in. 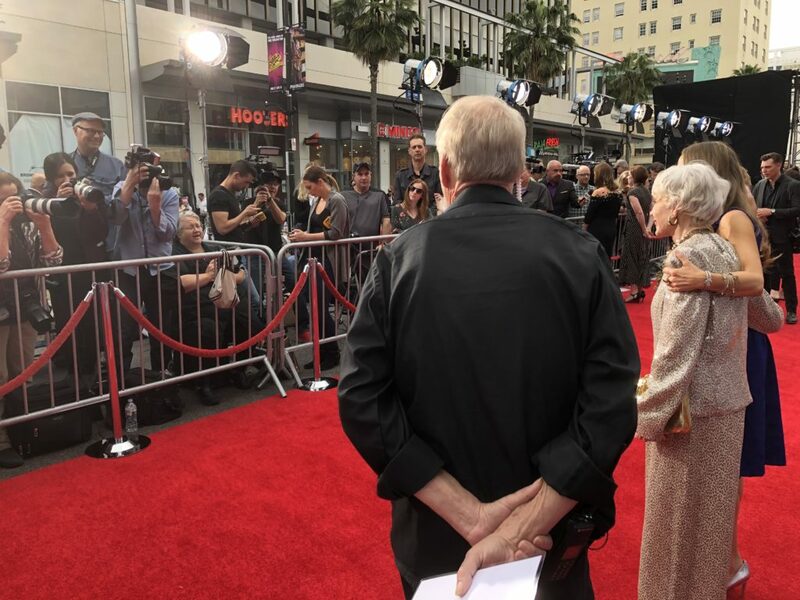 Once we de-Escaladed at the start of the step-and-repeat, I waited patiently as Barbara Rush and her daughter Claudia Cowan made their way past the river of paparazzi. Then I, followed by the nice woman holding a sign with my name on it, slowly made my way down the carpet. I’d stop, have pictures taken, take another step or two, more pictures, step and repeat. I once again tried out my line with the photographers — “I feel like Muybridge’s horse!” — to no avail. Once again, at the end of the line, I was asked “would you like to speak with the bloggers?” Oh, yes! The real press (for me, anyway). I chatted with Nora Fiore, a/k/a The Nitrate Diva and said hello to couple other bloggers I knew. What happened next did not happen last year. 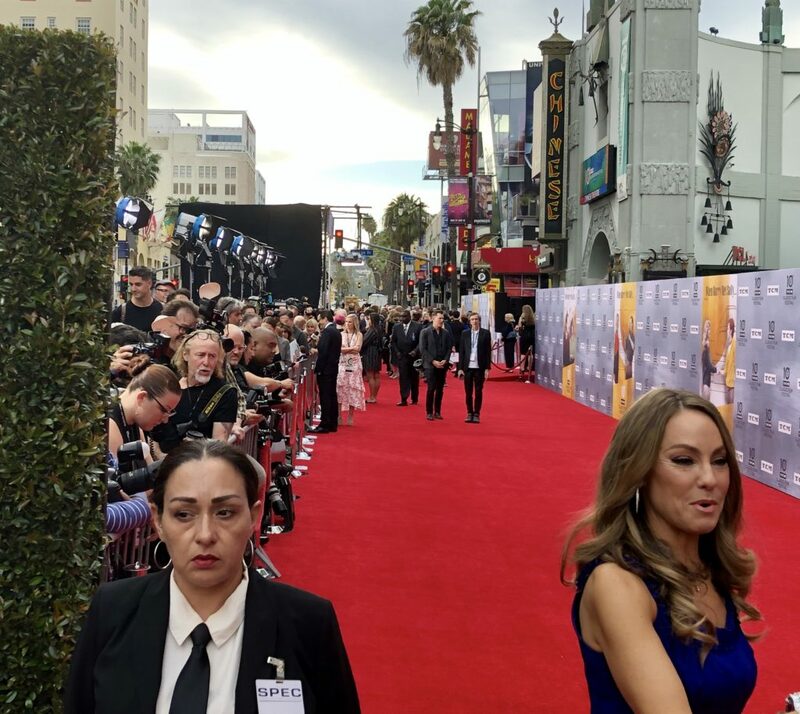 Just before making the 90º right turn to head down the next stretch of carpet leading to the entrance of Grauman’s Chinese Theater, I bumped into someone I knew from TCM who produces the on-air wraparounds for the films that are shown. We chatted and then he asked me if I’d like to be interviewed by Alicia Malone. Alicia is one of the newer TCM hosts, and was on a well-lighted platform just nearby and up a few steps. I said “sure” and went up onto the platform. She asked me what she was probably asking everyone who wasn’t Rob Reiner or Barbara Rush, what was it that we movie fans were obsessed with about romance in the movies. This was the festival’s theme this year. I was at the festival to accompany a double-feature of Tom Mix westerns. I somehow made a quick pivot to Tom Mix, and we spoke briefly about why I was at the festival (what was I going to do, talk about Mix and his horse Tony?). Alicia asked me what I was most interested in seeing at the festival. I didn’t remember most of the highlighted titles of films most fans were there to see, so I blurted out that I was mainly looking forward to seeing Kevin Brownlow get the Robert Osborne Award. I figured I might as well plug Kevin, and it was the thing I was really looking forward to. Alicia thanked me and I headed into the theater for the big event, a screening of ”When Harry Met Sally”. And I figured, well, that was still fun to get to do, but I can’t imagine they’ll be able to use anything I said. Fabulous! What an honor and thrill for you, Ben! Lovely to see all these icons of my cinematic past in the present!